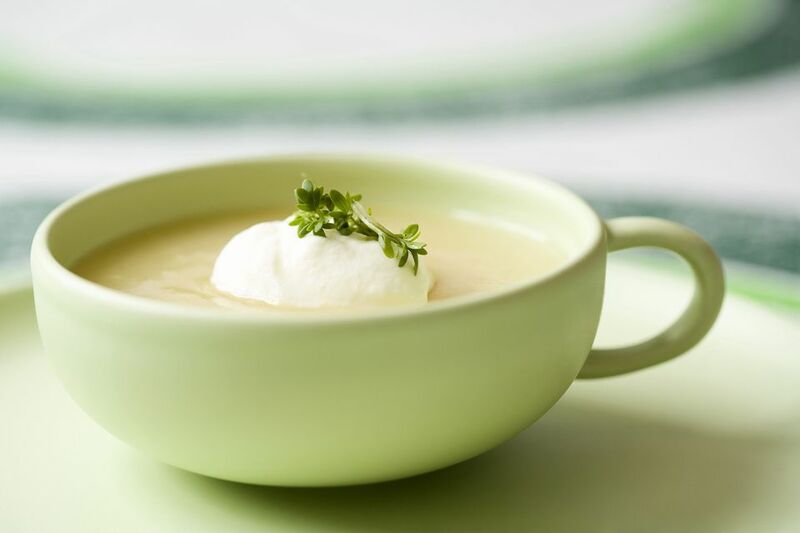 This Hungarian Creamy Kohlrabi Soup (Karalábé Leves) recipe is perfect for vegetarians but, because it contains dairy, would not be appropriate for vegans. In any case, it's a delightful light way to start a multicourse meal. Kohlrabi, a popular Eastern European vegetable, tolerates frost well and can be stored a long time in a root cellar. Kohlrabi is a cruciferous vegetable possessing myriad health benefits. The bulbs come in white and purple varieties. The white variety is more flavorful and tender when small, with a hint of radish and cucumber flavors. Purple Kohlrabi tends to have a slightly spicier flavor. Melt 2 tablespoons butter in a large pan with a lid. Add 1 medium chopped onion and cook gently until soft, about 10 minutes. Add 1 pound kohlrabi bulbs, peeled and chopped, and cook 2 minutes. Add 2 1/2 cups vegetable stock, 2 1/2 cups milk, and 1 bay leaf to the pan and bring to a boil. Cover, reduce heat to low and simmer 25 minutes or until kohlrabi is tender. Let cool a few minutes and remove bay leaf. Using an immersion blender, conventional blender or food processor, purée soup until smooth. You may want to strain the soup through a fine sieve if the kohlrabi is especially fibrous. Season to taste with salt and pepper. Serve in heated bowls with a hearty bread of choice. If your kohlrabi bulbs come with the green tops, blanch them and clean as you would for spinach, stripping the leaves down off the tough center stem. Roll the leaves and slice across as for a chiffonade of basil. Kohlrabi belongs to a class of vegetables known as cruciferous or Brassica. Cruciferous vegetables are high in antioxidants, which scientific research has proven to be beneficial in fighting certain cancers. The name "cruciferous" is from New Latin and refers to the flowers and leaves that form a cross shape. Cruciferous vegetables are also low in calories and high in fiber, calcium, iron, vitamins A and C and beneficial enzymes. Included in this group of vegetables are cabbage, broccoli, Brussels sprouts, kale, kohlrabi, cauliflower, bok choy, radishes, rutabagas, turnip leaves, collard greens, and more.